The new Emaar headquarters ... reflecting the company’s vision. 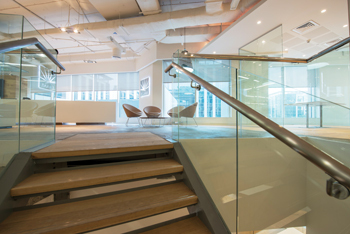 Emaar’s new office in Dubai has made striking use of American hardwood for a staircase and reception area creating a ‘wow’ and unifying factor that helps translate the leading property developer’s vision. Dwp | design worldwide partnership has created a new dynamic workplace for Emaar, one of the world’s largest property developers, at Emaar Square in Downtown Dubai – one that reflects the company’s vision, future and its ever-increasing role in Dubai, UAE. Spread over three levels and 6,250 sq m, the project has aimed to reflect Emaar’s core values through open-plan airy workspaces, which are connected through an American White Oak staircase and reception. Emaar’s previous office was located in Emaar Business Park and spread over six floors. With fragmented departments and limited shared facilities, the interior was uninspiring and detached from the company’s forward-thinking conceptual foundation, according to dwp. With the new office, Emaar wanted to relocate its entire team into a new dynamic workplace – one that translated its vision for the future into an extraordinary design aesthetic, as a clear reflection of the Emaar brand. George Kahler, dwp design director, explains: “There are many drivers for change in a company’s decision to refurbish their offices or relocate. Emaar’s corporate values were not reflected in its previous property. Its dynamic, collaborative business process was being hindered by the cellularised spaces. The client’s brief required plenty of natural daylight, long worktables, an open-plan with no doors, taking a loft style, with a collaborative and communicative approach. It was a clear and direct vision and, according to Kahler, dwp delivered exactly on Emaar’s requests. As such, the results speak for themselves, with an impactful workspace, inviting for clients and motivating for the team. With three floors linked, all 15 departments have been centralised to one location. Further, the open-plan is also efficient and provides a space for collaborative working. “Emaar’s previous offices supported it through a different era for the development industry. It was emerging from the financial crash and wanted to claw back its entrepreneurial spirit, to shape up its operations, inspire the staff to perform and drive the organisation forward,” says Kahler. The American White Oak staircase … connects the various sections of the head office building. The project, led by Mohammed Alabbar, Emaar chairman, was not an ordinary relocation project, he says. “It was to be an honest reflection of the company’s vision, future and its ever-increasing role in the framework of a growing Dubai. A quick look at the floorplan shows different areas called ‘neighbourhoods’ located throughout the layout. “The new space has fewer offices and more shared collaboration areas and is, therefore, a far more efficient use of real estate, giving the client a much higher return on productivity versus real estate area. Central to each floor is a variety of collaborative workspaces offering an infinite array of meeting scenarios, rather than a series of cellular fixed meeting rooms. This freed up far more space given to open-plan working,” he adds. The brief also called for no doors, standing meeting rooms and creative spaces. According to Kahler, a key to the design was the lining staircase, which provides a connected feel throughout the floors. The new office rejects the corporate office style, as well as the overtly branded one. Instead, it focuses on an interior that is both reflective of the company’s confidence and vision, as well as the conceptual styles that are appreciated by modern design culture. American White Oak was specified for the staircase (30-40 mm wood cladded to the mild steel structure), and wall partitions and cladding behind the main reception, which are all solid wood. 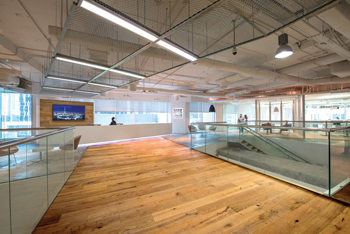 All of the interior joinery on this project, excluding the workstations, was undertaken by Aati Contracts. According to Jonathan Greedy of Aati Contracts, it was an interesting project to work on, especially in terms of design and finishes. All initial samples were discussed with dwp, submitted and approved by them. In addition, a few mock-ups were made at Aati’s factory in Dubai. Factory visits were arranged at different stages of production to ensure quality control as well. Despite a few pre-handover amendments, Aati was able to complete the project within the time frame agreed upon. While the new Emaar headquarters boasts an intelligent interior design that ideally represents the inhabitants in an accurate, subtle way, the community-based approach applied by the property developer is not only obvious in its official dealings, but also its office design. dwp made sure to follow all the sustainability guidelines of Leed (Leadership in Energy and Environmental Design) certification. It illustrates that the client was not only concerned with the aesthetics and function of the office, but also the environmental impact.